1. More than 1000 entries on the Sikh religion , history, and society explained in an accessible way. The entries include specific terms such as bana, bhog, and bunga, as well as general concepts as they occur within Sikh belief , such as monogamy, patriarchy , and rites of passage. 2. Thoughtful cross-referencing within entries to facilitate use of the Dictionary by lay readers. 3. An extensive updated bibliography of extant works in the English language on the religion and history of the Sikhs. This is a necessary source-book for students,scholars, and general readers in Sikh Studies. Practising Sikhs will find the Dictionary immensely useful. For those with little knowledge of Sikhism, it will be an invaluable companion to any work on the Sikh religion. 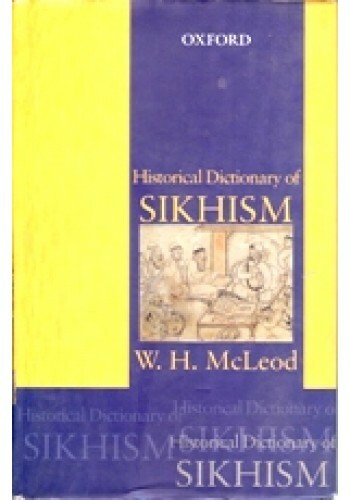 'Hew McLeod is the leading scholar of Sikhism in the western world and this dictionary provides an authoritative reference work for those interested in the history and development of this important religious movement and the Sikh community'. 'Hew McLeod is to be commended for the splendid resources that he has placed in the hands of those seeking to understand the history and religion of the Sikhs'. W. H. McLeod is a New Zealander and is Emeritus Professor at the University of Otago in Dunedin. He took an MA from the University of Otago and a PhD from the School of Oriental and African Studies in London. Fore nine years McLeod taught in the Punjab and developed a life-long interest in the Sikhs. He returned to teach History in the University of Otago in 1971, and since then has paid frequent visits to the Punjab. All of his books and most of his published articles concern Sikh history, religion , and sociology. W. H. McLeod is the author of Guru Nanak and Sikh Religion (1968), The Evolution of the Sikh Community (1976), Early Sikh Tradition (1980), Who is a Sikh? 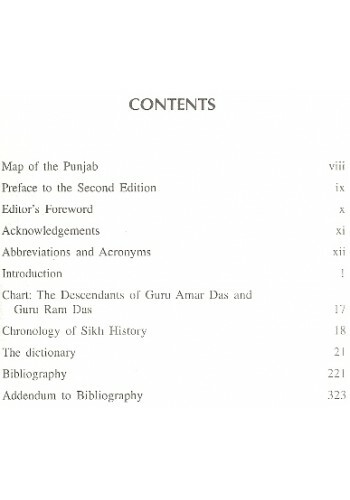 (1989), Exploring Sikhism (2000), and Sikhs of the Khalsa (forthcoming). Due to the distinctive way most of them dress, Sikhs can be recognized not only on the Indian subcontinent where the largest communities dwell but also by a vast number of people throughout the world. Unfortunately, the overwhelming majority of those who can recognize them would be extremely hard put to explain the basic tenets of Sikhism. That could even apply to many of their neighbors on the Indian subcontinent, and all the more so to those encountering newer Sikh communities in Europe, the Americas, and Asia. That is a very unfortunate gap with regard to one of the world's more active and dynamic religions. 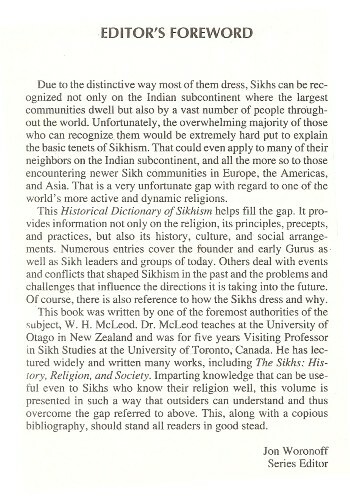 This Historical Dictionary of Sikhism helps fill the gap. It provides information not only on the religion, its principles, precepts, and practices, but also its history, culture, and social arrangements. Numerous entries cover the founder and early Gurus as well as Sikh leaders and groups of today. Others deal with events and conflicts that shaped Sikhism in the past and the problems and challenges that influence the directions it is taking into the future. This book was written by one of the foremost authorities of the subject, W. H. McLeod . 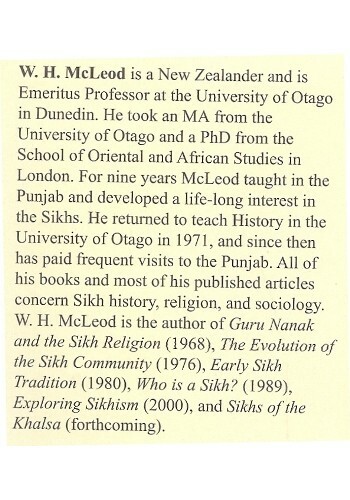 Dr. McLeod teaches at University of Otago in New Zealand and was for five years Visiting Professor in Sikh studies at the University of Toronto, Canada. He has lectured widely and written many works, including The Sikhs: History, Religion , and society. Imparting Knowledge that can be useful even to Sikhs who know their religion well, this volume is presented in such a way that outsiders can understand and thus overcome the gap referred to above. This, along with a copious bibliography , should stand all readers in good stead. From The Backcover Of 'Sikhs Of The Khalsa, A History Of The Khalsa Raihait' By W.H. McLeod ..
From The Frontcover Of Book 'Sketch of The Sikhs' Book By Lieutenant Colonel Malcolm - Prithipa..
From The Backcover Of 'Dictionary of Sikh Names' By Parmit Kaur Chilana - Rajwant Singh Chilana ..
Summary Of 'Dhadi Darbar - Religion, Violence, And The Performance Of Sikh History' By Michael Nijha..
From the Backcover of 'A Popular Dictionary Of Sikhism' By W. Owen Cole And Piara Singh Sambhi ..
From The Backcover Of 'Sikhism' By Hew McLeod 'McLeod has done more for Sikh history th.. The Sikhs - History, Heritage, Principles, Practices - Book By Gurinder Singh Sacha ..